I don’t know what it was when she did this but it just made me feel so loved and safe and valued and important and that I mattered and I am even getting teary eyed as I think about it right now, and my Omi has not been with us for 22 years, and yet thinking of the way she made me feel so loved and the way she expressed that love for me, mattered to me. She communicated by the words she said, by the way she treated me, by the way she had time for us, by the way she was always present for us, that we were her world. As a mom of five and as an Omi myself of three, I want so much to do this with my kids and Sweet Littles. 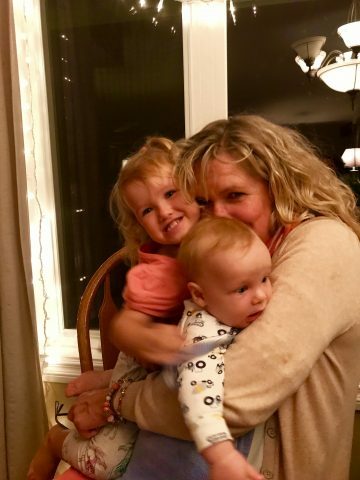 When I was a young mom, I do not know if I thought this through at first, how I wanted to make my kids feel, that I wanted them to know they are my world, but somewhere in my motherhood journey, I began to recognize that is what I was doing. I began to name it, that I wanted to make my kids feel like they are loved. Kids feel it, they will know deep down, if they are your world or if they are just an inconvenience. When we look our kids in the eyes, when we say their name in an endearing way, when we hug them, when we tell them we love them, when we sit with them and play with them and read to them and go on special walks in the neighborhood with them, when we are present with them, when we get excited to see them, when we take time for them, then they will know. Make your kids feel that they are your world.